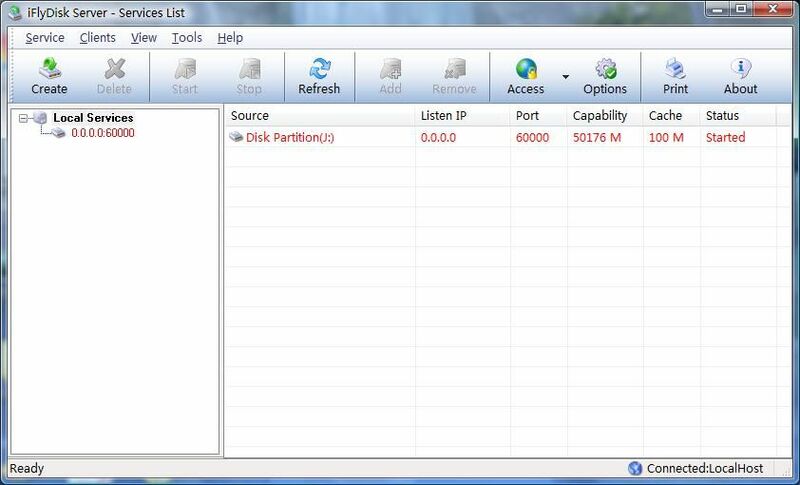 iFlyDisk is a network based virtualized disk mapping software for Windows. High speed, about 80MBytes/S ~100MBytes/S in 1000MB Ethernet environment. Mapping partitions on server to other computers. Mapping a disk image file on server to disk drives on other computers. Using the virtual disks is all the same as real ones, format, read files, write files and execute programs, etc. By default, all the operations on clients will take effect locally, after remounted the virtual disk or restarted computer, the data on the clients will be recovered, but also can make one client as a operator which have full access rights and can modify server disk directly. Clients can map a local image file to virtual disks that is, clients can use this system as a disk emulator without servers. Support series of 2000/XP/2003/VISTA/2008 operating system. It can work within internet environment.